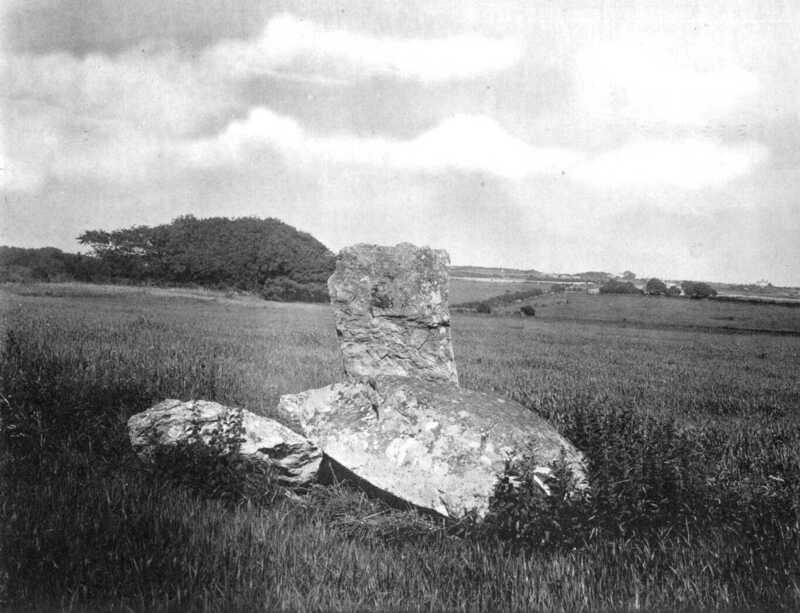 This Cromlech and the one described on the preceding page are to be seen on a field belonging to Hentrefor farm, on the left hand of the road leading from Beaumaris to Pentraeth, and about one mile and a half from Llansadwrn Church. One of the uprights (of the north-east view) is still standing, and is six feet high by six feet wide at the base and three feet ten inches at the top; and at one side is one foot ten inches thick, and on the other side, ten inches. The remaining support has fallen down partly beneath the capstone, and is six feet long by four feet ten inches wide and one foot ten inches thick. The capstone is lying with one end on the above fallen support, and the other end on the ground, and is ten feet long by seven feet six inches wide, and is three feet thick at one end, and one foot at the other. This Cromlech was standing in 1802.